Two auctions closed last Sunday: Team De Jaeger sold their best birds in auction (2011-2017), and there was also a minor auction of Jan Hooymans. The two auctions raised 952.350 euro in total, with an average of 3,132 euro/bird. Zondag eindigden 2 veilingen. De eerste was de veiling van de beste duiven van Team De Jaeger (2011-2017) en we eindigden met een kleine veiling van Jan Hooymans. Totaal voor de 2 veilingen vandaag werd 952.350 EURO voor 304 duiven, gemiddeld 3.132 EURO/duif. 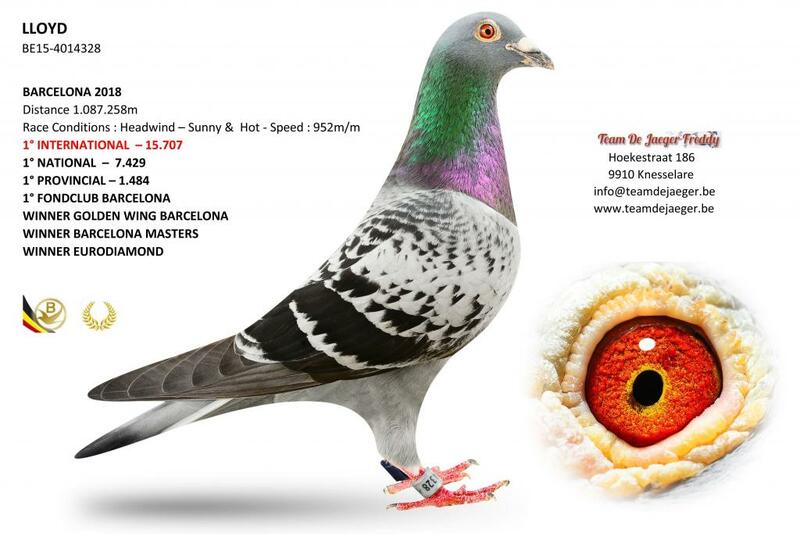 Team De Jaeger has had some fantastic seasons in recent years, winning several 1st national ace pigeon titles KBDB, and most importantly an international first prize from Barcelona in 2018, a particularly difficult race. With so many great results to their name, Team De Jaeger decided it was time to sell their best pigeons on PIPA. The parents of Lloyd were sold about an hour later, as a couple, and they went to a Chinese fancier for 51,000 euro. The second most expensive pigeon in auction, after Lloyd, was Bleke Bourges, winner of a 2nd National Bourges. He is also moving to China, with a sale price of 104,000 euro. The entire collection of De Jaeger pigeons was sold for 881,950 euro in total. The 293 pigeons will be moving to several different countries: China (73), Belgium (72), Taiwan (51), Japan (21), Sri Lanka (19), Romania (9), the United Kingdom (8), France (7), Germany (7), Thailand (5), The Philippines (4), The Netherlands (4), Poland (2), Iraq (2), Canada (2), Albania (1), Argentina (1), Spain (1), Italy (1), USA (1), Portugal (1), and Greece (1). The second auction of the day was the Hooymans auction, in which Jan sold 11 unflown pigeons. Among them were a few eye-catchers, including for instance the only youngster of Birdy ever to be sold in auction. He goes to China for 14,600 euro. The most expensive pigeon in auction is a son of Harry, paired to a wonderful daughter of Birdy; he was sold to China for 23,000 euro. Eleven pigeons were sold for 70,400 euro in total, to fanciers from China (3), Taiwan (2), The Netherlands (2), the USA (1), Poland (1), Italy (1) and India (1).